In a previous video, I gave some advice on how to write a mission statement. 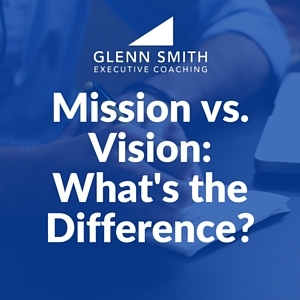 However, there is a lot of confusion between the mission versus the vision of an organization. I mentioned this difference briefly in the video blog, but here is a table that will help you gain greater clarity between the two. If you are still confused, please watch our video “Mission-Vision-Values: The Foundation of Every Great Company“, or contact me directly. I would welcome the opportunity to discuss this with you and help you gain the clarity you need as a business leader. Mission answers the question “Why do we exist?” Vision answers the question “What will the future look like as we fulfill our mission? What will be different?” While mission is about today, vision is about the future, what we will become. Your mission can and should be written in a short, concise statement. It should pass the “T-shirt” test, meaning, it should be able to be printed on a t-shirt and still be readable. The vision needs to be more than a statement. It should be a description. This description may be a paragraph or a whole page. It should paint a picture of the future that will come to be as we carry out our mission. Do NOT Have Two Statements! Some books and consultants encourage business and organizational leaders to write two statements, a mission statement and a vision statement. However, when companies have two statements those statements begin to compete with each other and no one remembers either. Also, employees typically fail to see or value the difference between the two statements. So I recommend writing ONE statement, and make that your mission statement. Once you have clarity around your mission, then you are ready to dream about the future and how it will be different. That’s your vision! To read more about vision see our index of posts about vision. If you’re interested in continuing to grow as a leader let me encourage you to download our FREE ebook “Mission, Values, Vision: The Comprehensive Guide to Creating the Mission, Values, and Vision For Your Company.” This will help you increase your leadership capacity and impact! Also, you may consider engaging a coach. An experienced coach will help you grow faster and stronger! Contact us if you want some guidance in implementing your mission and vision at your organization! Mission vs. Vision: What's the Difference? 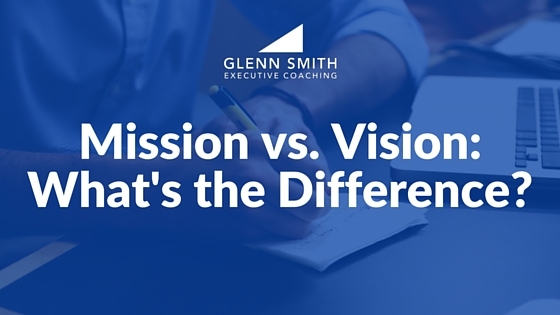 There is a lot of confusion around the difference between a mission and a vision. This will help you as you write your mission statement. Gain clarity here. plz give me some ideas…..
Sir, I want to write The important of mission, The Biblical foundation of Mission, What major can we learn from today and What is the mission approach (or) Relevant in today context. pls could you share me your idea? Can a company glow up with a mission without vision? How can you recognise a failed mission? how to make onw vision and mission statements? Thanks Glenn for the tips! this is a great Idea !! Is your free ebook available for the Philippines? sir,I want to know how I can to write own vision and mission? sir how can I write own mission and vision for my soft ware company. .
its helps me a lot ! Thank you ! Mission – How do you get there? Thanks for the thoughtful discussion. I found the table comparing mission and vision particularly useful. Fine suggestions and extremely true. One of the vital important things bloggers, or almost any enterprise, are capable of doing is never surrender. Even though instances are powerful it is essential to be there to your viewers and prospects since they will be gonna just remember you in the good light as soon as issues get much higher and you can be rewarded with your hard works. Very good info. I wld love to visit your office if u can help me.. Which come first : policy, mission and vision ….and why??? Thank you very much sir, how do I write develop a good mission & vision statement for my business sir?